Episcopal News Service – Austin, Texas] The legislative committee charged with providing a pathway toward revision of the Book of Common Prayer took preliminary steps July 4 after a hearing filled with impassioned testimony. 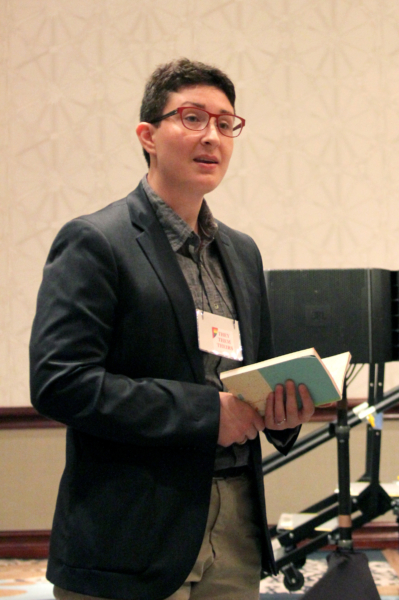 The committee – officially titled the Committee to Receive the Report of Resolution A169(https://extranet.generalconvention.org/governing_and_interim_bodies/interim_bodies/690/roster) – heard speakers say that prayer book revision is needed immediately to correct the overwhelming use of masculine language to refer both to God and to human beings, as well as a lack of imagery calling for the care of creation. Two resolutions on the Prayer Book – A068 and A069 – were presented by the Standing Commission on Liturgy and Music in response to calls from the 78th General Convention in 2015 to begin prayer book of revision. Resolution A068 sets out a process of full prayer book revision, beginning in the next three years and culminating in a new authorized Book of Common Prayer in 2030. Resolution A069 offers instead a process of deeper engage with the current 1979 Prayer Book, to help members explore riches of services and prayers that are seldom used. — Melodie Woerman is director of communications for the Diocese of Kansas and a member of the ENS General Convention reporting team.